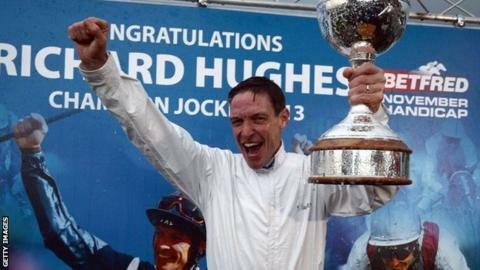 Champion jockey Richard Hughes is expected to return to racing this week, less than a month after fracturing his vertebra. Hughes was injured in a fall at the Dubai World Cup meeting at Meydan in March. The 41-year-old is likely to feature at Sandown on Friday. His wife, Lizzie Hughes, tweeted: "Richard got the all clear from the doctor this morning which is great news, back riding on Friday." Following his fall last month, Hughes told the BBC: "I'll have another X-ray on 23 April. As long as that is clean, I'll ride on two days later."